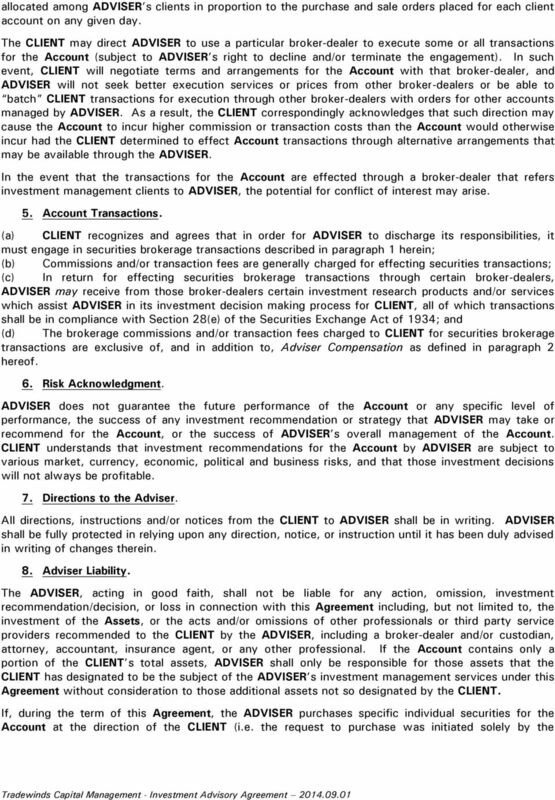 Download "I N V E S T M E N T A D V I S O R Y A G R E E M E N T"
5 shall not be considered an assignment pursuant to Rule 202(a)(1)-1 under the Investment Advisers Act of Should there be a change in control of the ADVISER resulting in an assignment of this Agreement (as that term is defined under the Advisers Act), the successor adviser will notify the CLIENT and will continue to provide the services previously provided to the CLIENT by the ADVISER. 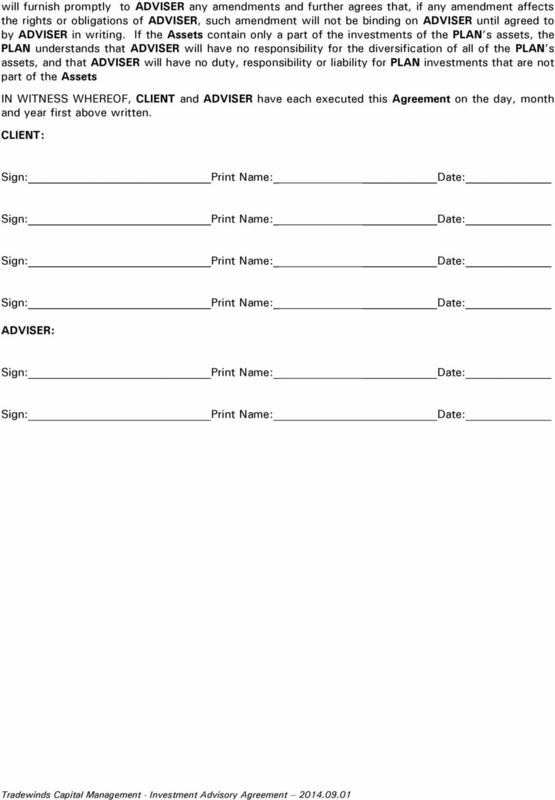 If the CLIENT continues to accept such services provided by the Successor without written objection during the 60 day period subsequent to receipt of the written notice from the Successor, the Successor will assume that the client has consented to the assignment and the Successor will become the adviser to the client under the terms and conditions of this Agreement. 13. Non-Exclusive Management. ADVISER, its officers, employees, and agents, may have or take the same or similar positions in specific investments for their own accounts, or for the accounts of other clients, as the ADVISER does for the Assets. CLIENT expressly acknowledges and understands that ADVISER shall be free to render investment advice to others and that ADVISER does not make its investment management services available exclusively to CLIENT. Nothing in this Agreement shall impose upon ADVISER any obligation to purchase or sell, or to recommend for purchase or sale, for the Account any security which ADVISER, its principals, affiliates or employees, may purchase or sell for their own accounts or for the account of any other client, if in the reasonable opinion of ADVISER such investment would be unsuitable for the Account or if ADVISER determines in the best interest of the Account it would be impractical or undesirable. 14. Death or Disability The death, disability or incompetency of CLIENT will not terminate or change the terms of this Agreement. 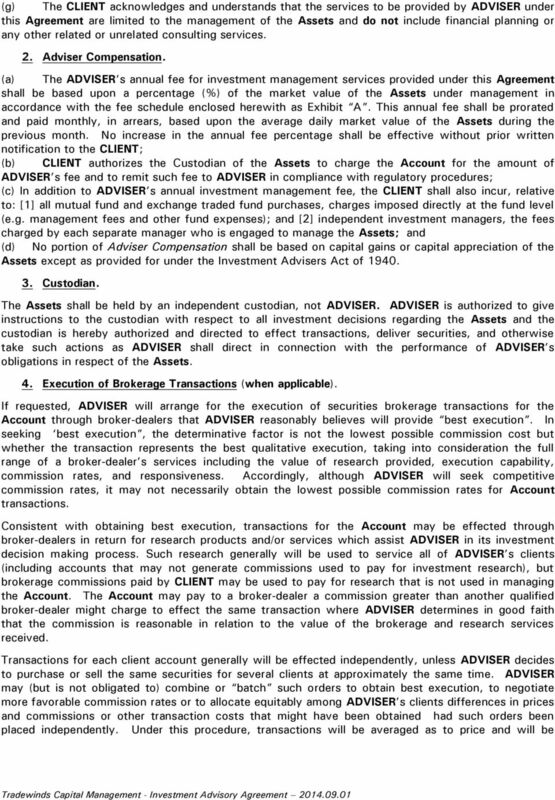 However, CLIENT s executor, guardian, attorney-in-fact or other authorized representative may terminate this Agreement by giving written notice to ADVISER. CLIENT recognizes that the custodian may not permit any further Account transactions until such time as any documentation required is provided to the custodian. 15. Arbitration Subject to the conditions and exceptions noted below, and to the extent not inconsistent with applicable law, in the event of any dispute pertaining to ADVISER s services under this Agreement that cannot be resolved by mediation, both ADVISER and CLIENT agree to submit the dispute to arbitration in accordance with the auspices and rules of the American Arbitration Association ( AAA ), provided that the AAA accepts jurisdiction. ADVISER and CLIENT understand that such arbitration shall be final and binding, and that by agreeing to arbitration, both ADVISER and CLIENT are waiving their respective rights to seek remedies in court, including the right to a jury trial. CLIENT acknowledges that CLIENT has had a reasonable opportunity to review and consider this arbitration provision prior to the execution of this Agreement. CLIENT acknowledges and agrees that in the specific event of non-payment of any portion of Adviser Compensation pursuant to paragraph 2 of this Agreement, ADVISER, in addition to the aforementioned arbitration remedy, shall be free to pursue all other legal remedies available to it under law, and shall be entitled to reimbursement of reasonable attorneys fees and other costs of collection. 16. Disclosure Statement. 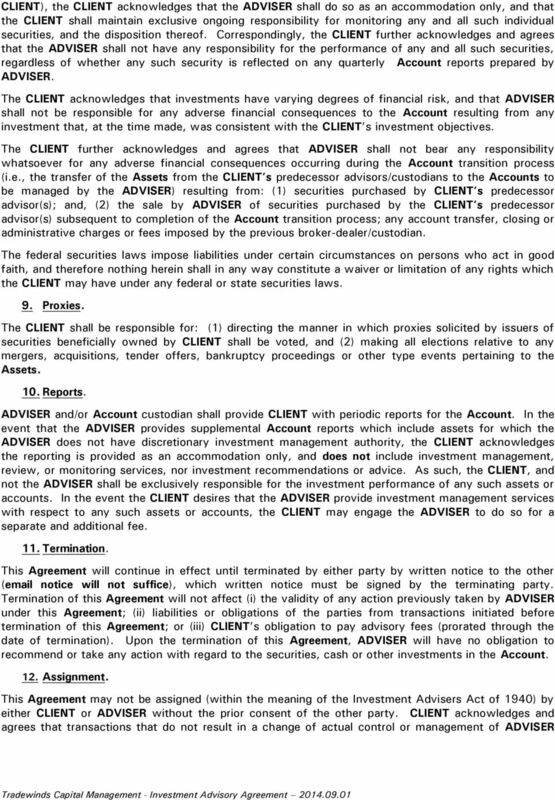 CLIENT hereby acknowledges prior receipt of a copy of the Disclosure Statement of the ADVISER as same is set forth on Part II of Form ADV (Uniform Application for Investment Adviser Registration). CLIENT further acknowledges that CLIENT has had a reasonable opportunity (i.e. at least 48 hours) to review said Disclosure Statement, and to discuss the contents of same with professionals of his choosing, prior to the execution of this Agreement. 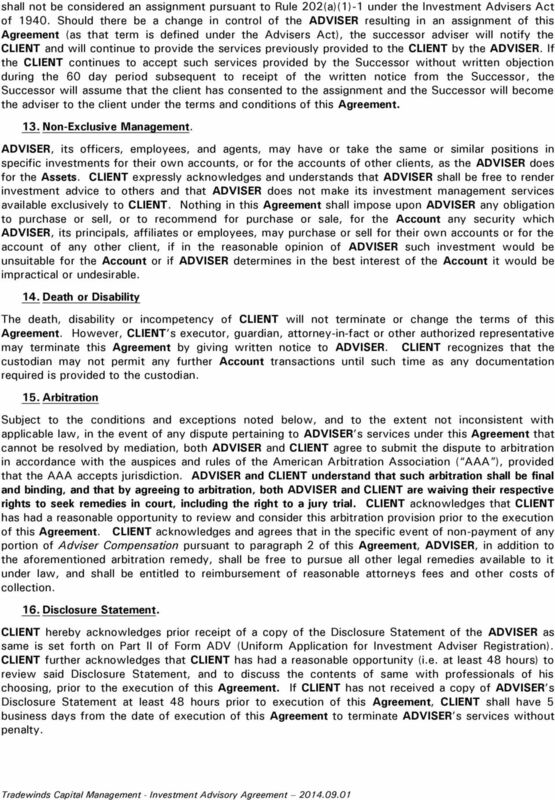 If CLIENT has not received a copy of ADVISER s Disclosure Statement at least 48 hours prior to execution of this Agreement, CLIENT shall have 5 business days from the date of execution of this Agreement to terminate ADVISER s services without penalty. 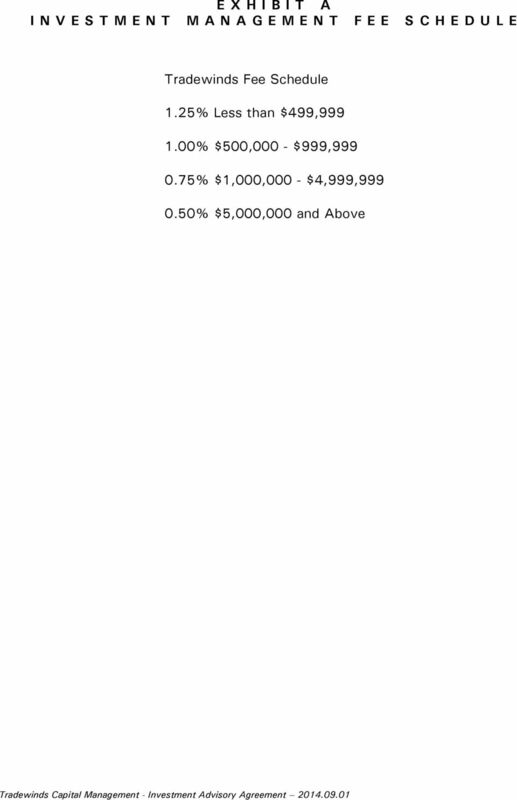 10 S C H E D U L E A R E T I R E M E N T P L A N C O M P E N S A T I O N S C H E D U L E The ADVISER shall be compensated based upon a percentage of the assets in the Plan in accordance with the following fee schedule: 0.75% Less than $1,999, % $2,000,000 - $4,999, % Over $5 Million Unless otherwise agreed to, in writing, the ADVISER shall debit the PLAN account(s) for its fee. The annual fee shall be paid quarterly, in arrears, based upon the market value of the average of Plan's assets on the first and last day of the preceding quarter. 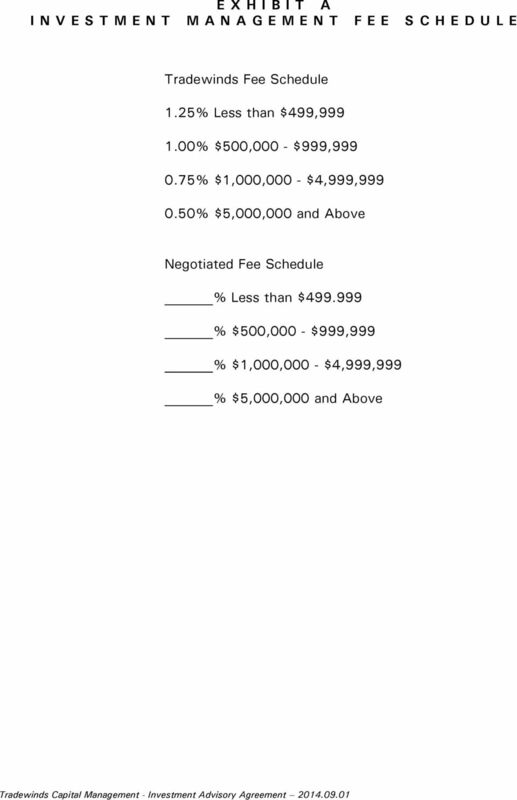 Unless otherwise indicated below, the only source compensation to be received by the ADVISER shall come from the PLAN in accordance with the above fee schedule. OTHER SOURCES OF COMPENSATION: None (or Please list) Type Source Amount Relationship to ADVISER/Conflict NONE OTHER FEES/COSTS: There may be additional fees incurred by the PLAN for Planrelated services that are not provided by the ADVISER, including Plan administration, professional services (i.e., accounting and legal), and Plan custody. 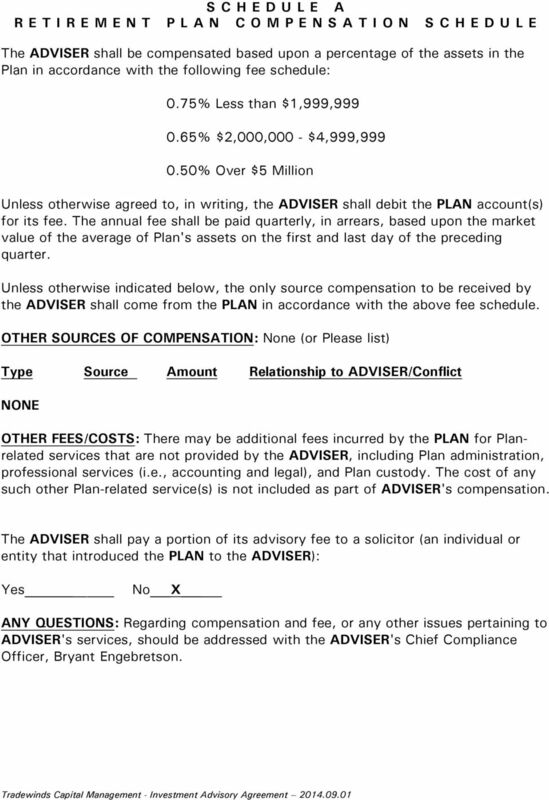 The cost of any such other Plan-related service(s) is not included as part of ADVISER's compensation. 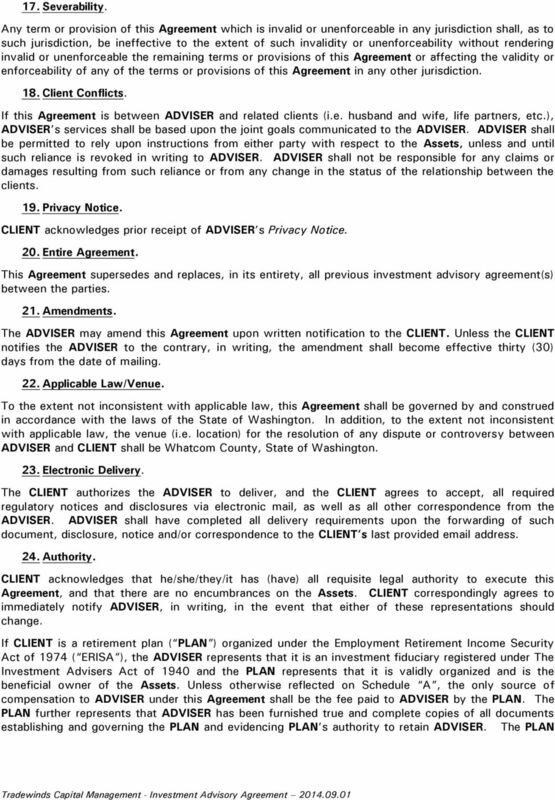 The ADVISER shall pay a portion of its advisory fee to a solicitor (an individual or entity that introduced the PLAN to the ADVISER): Yes No X ANY QUESTIONS: Regarding compensation and fee, or any other issues pertaining to ADVISER's services, should be addressed with the ADVISER's Chief Compliance Officer, Bryant Engebretson. 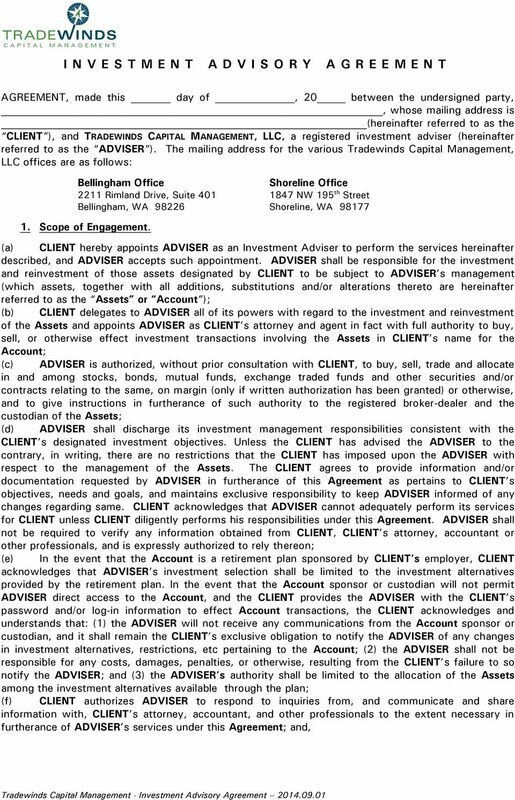 SPRING OCEAN CAPITAL LLC INVESTMENT ADVISORY AGREEMENT Spring Ocean Capital LLC ( Advisor ), and Client enter into this Investment Advisory Agreement ( Agreement ) as of the Effective Date (signing date).